Urinary tract inflammation and infections are a very common problem, mainly in women but not exclusively so. Infections in the urinary tract can occur all along the urinary system including in the kidneys, the bladder and the urethra. A urinary tract infection can be identified by the following symptoms: pain or a burning feeling while urinating, straining during urination, urinating with unusual frequency, urine retention and sometimes even urinary incontinence. The traditional method of dealing with infections of this kind is with antibiotic treatment. While antibiotic treatment is effective in eliminating the germs causing the infection in the urinary tract, the treatment also harms the population of good bacteria in our intestines, causing an imbalance of the intestinal flora, which could cause an array of other, even more severe problems. 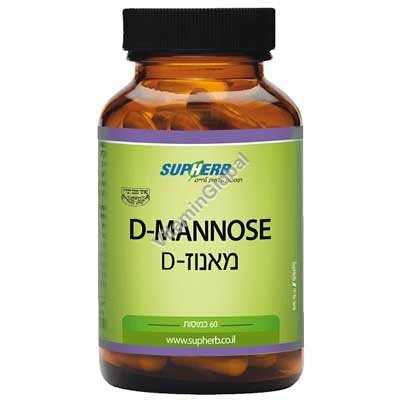 SupHerb’s D-Mannose contains a concentrated dosage of 600 mg. of active ingredient. Directions for use: 1-2 capsules daily, with meals. SupHerb's D-Mannose was not tested on animals. Pregnant women, nursing mothers, people taking prescription medication, and parents considering this product for their children should consult a doctor.